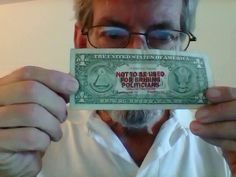 In the picture above, Doug Hughes holds a dollar bill stamped with the message: "Not to be used for bribing politicians." Just over a year ago, Hughes was arrested for landing a gyrocopter in the lawn of the U.S. Capitol (a violation of restricted airspace). He characterized the act of civil disobedience as a "stunt" designed to call attention to the corrupting influence of money in politics. A mail carrier in his 60s, Hughes wanted to deliver 535 letters--one for each member of Congress--concerning the urgent need for campaign finance reform in America. After being arrested, Hughes planned to challenge DNC Chair Debbie Wasserman-Schultz for her seat in the House of Representatives. Hughes was motivated to run because he considers Wasserman-Schultz "the poster child of corrupt politics in the Democratic Party." Those who consider it corrupt for a representative to take money from the predatory lending industry and then work to repeal consumer protection laws in that industry might be inclined to support Hughes' candidacy. But alas! Such support now comes too late, as Hughes has suspended his campaign in support of another rival for Wasserman-Schultz' seat, Tim Canova. Canova is a law professor who, according to the New Times of Broward-Palm Beach, is "part of the frothing section of the populace that is pulling for Bernie Sanders." At one point in the interview, she says she would wager "a lot of money" that any corruption in the Democratic Party is trivial, in the eyes of most voters, compared to the ongoing meltdown in the GOP. Regrettably, Chariton failed to ask which payday loan service would be spotting the money for that wager to Wasserman-Schultz as a thank you for the important work she does to cripple the Consumer Financial Protection Bureau.